As a scholar and PhD candidate, I’ve seen my share of in-house feuds among professors and within areas of study. You have the Renaissance and Victorians on one side of the divide and the Post-Modernists and Literary Theorists on the other. Somewhere in there, the Folklorists and Rhetoric guys are wandering the desert like the Israelites, trying to find the Promised Land. The vitriol within a university English department is quite unlike anything you’ve ever seen, and the battle for research money is indeed a nasty one. Thus, it’s no wonder there are so many turf wars; but the major battle is in deciding (or rather lobbying for) which works should be included in the Canon, and thus, which works should always be taught. Dante? Chaucer? Shakespeare? Milton? Of course. Pope? Swift? Jonson? Johnson? Yeah, okay. Barrett-Browning? Austen? the Brontes? Eh, they’re women, but I guess they can join. Woolf? Auden? Plath? Wait a minute. Let’s fight about this. Now I’m not arguing ol’ Billy is a superb storyteller and a master of writing the human psyche. The Tempest? Twelfth Night? Merchant of Venice? Othello? Sure! But why are we teaching Shakespeare? Some teachers choose not to teach Shakespearean dramas because getting high school students through the language of a play is like pulling teeth. From a shark. Then there is the other camp who cannot imagine any person’s high school career is complete without having read a Shakespearean play all four years, regardless of whether they enjoyed it or learned anything at all. This line of thinking goes: one simply cannot live a joyful, purposeful life without reading a Shakespearean play. Yet, let’s be honest, Shakespeare isn’t appropriate for all students. (Calm down! Put your swords back in their scabbards!) Certainly students should be challenged in their reading material, but when you have a classroom of diverse learners (which is always the case), a compulsory Shakespearean text hardly differentiates for all learners. How can you teach an early modern English text to a student who barely has a grasp of modern English? The shalls and haths and begottens are enough to send native speakers running! Students with dyslexia or other learning disabilities? Their sense of defeat is palpable once you tell them to turn to page 375 of their lit textbook. Me? I’m firmly, unequivocally, and resolutely on the fence about the Shakespeare dilemma. I spent my first four years of teaching dragging students through Romeo and Juliet and Julius Caesar and Macbeth, all standard curriculum for high school English. I hated it. I don’t hate Shakespearean plays, but I hated teaching the plays. More specifically, I hated reading the plays. After all, Shakespeare was a playwright and his work is meant to be seen and not read. There’s a reason Shakespeare didn’t include stage directions in his scripts–none were needed because the only people reading them were those in his troupe. No one sat around in an Elizabethan book club at Bards & Nobility sipping their non-fat pumpkin lattes from Ye Olde Starbucks discussing the similarities between Othello’s Iago and Milton’s Satan. Late seventeenth century scholars didn’t write dissertations about the use or absence of a comma in Hamlet’s speech and what it meant to the literary canon (a problem with which, by the way, I struggled in this title–isn’t “That is the question” a new sentence? Should I not then use a question mark after the second “read,” or should I remain faithful to standardized Shakespearean syntax? Aaahhh!). Would I teach a Shakespearean play if we viewed it instead? Absolutely! Do I think Shakespeare should be seen and not read in the high school classroom? Yes, and I think Will would agree. There’s a way to teach Shakespeare, and that is the way the plays were meant to be enjoyed: through the magic of the stage. There’s nothing wrong with allowing students to receive their Shakespearean literature the way original audiences would have enjoyed it, and then follow-up with reading selected scenes and speeches to examine relevant themes. If we did this, we might just start a new generation of Shakespeare aficionados… or at least keep students from dreading English class. 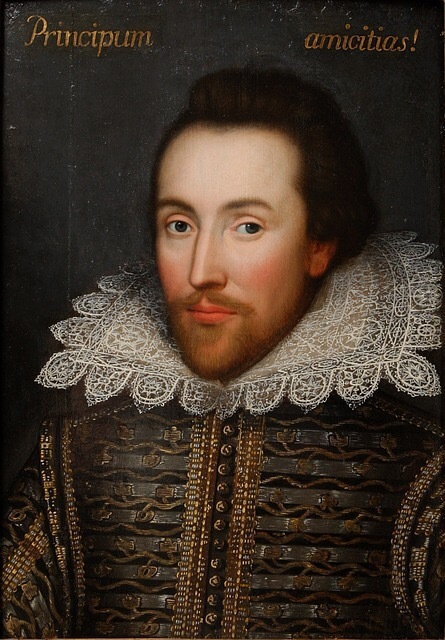 What are your thoughts about teaching Shakespeare? Share your ideas and tips!